Nathalie N. Hager is a Ph.D. candidate in the Interdisciplinary Graduate Studies program at the University of British Columbia’s Okanagan campus. She is writing her dissertation on World Art History, a turn in the discipline away from national histories and area studies towards modes that foreground connection and exchange, and how its discourse is developing in art historical theory and scholarship, museums, and pedagogy. All evidence points to Africa as the origin of our species … is Africa also the birthplace of art? 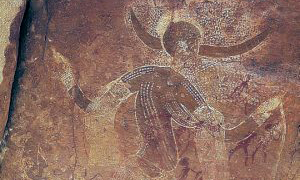 Who is this mysterious running horned woman, painted in a secluded, difficult to access part of Tassili? In an ancient North African “rock city,” modern explorers wetted a wall with water—revealing this graceful image. This stone marker depicts an abstracted human. How should we interpret one of the Arabia’s earliest artifacts? What can a few stones tell us about the origins of art? More than you might think!